The Amplified HumPRO™ Series long-range transceiver adds a front-end amplifier block to the popular HumPRO™ Series. This boosts transmitter output power to +25dBm and receiver sensitivity to -108dBm. This 133dB link budget gives the Amplified HumPRO™ Series transceiver a range of up to 12.9km (8 miles) while supporting a data rate of 115.2kbps. 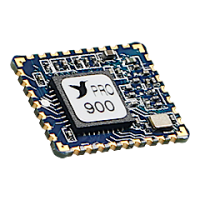 The 900MHz module has achieved FCC and Industry Canada modular certification. The HumPRO™ Series is a Frequency Hopping Spread Spectrum (FHSS) transceiver designed for the reliable transfer of digital data. It has a very fast lock time (<60ms typ) so that it can quickly wake up, send data and go back to sleep, saving power consumption in battery-powered applications that have strict power budgets. Two versions are available with FCC and Industry Canada certifications as well as a non-certified version that is smaller and lower cost. 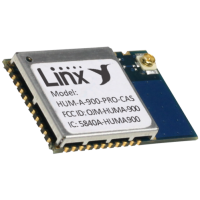 The HumDT™ Series is built on the Hummingbird platform and is designed for reliable wireless digital data transfer. It includes a frequency agile protocol and supports versions at 868 and 900MHz with a common footprint and pin out. The DTS and EUR Series combine a low power 868MHz or 900 MHz wireless transceiver with a powerful multipoint-to-multipoint protocol controller to form a complete wireless communication solution capable of replacing wires in almost any RS-232/422/485 application. 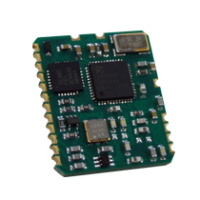 The module has a Universal Asynchronous Receiver Transmitter (UART) serial interface that can be connected directly to microcontrollers, RS-232 converters or USB adaptors. 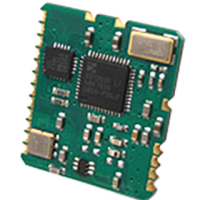 The module automatically handles all radio functions resulting in a UART-to-antenna wireless link. The 25 Series RF transceiver module is designed for reliable bi-directional transfer of digital data over distances of up to 1 mile (1.6km) line of sight. Operating in the 902 to 928MHz frequency band, the module is capable of generating +13dBm into a 50-ohm load and achieves an outstanding typical sensitivity of -105dBm. 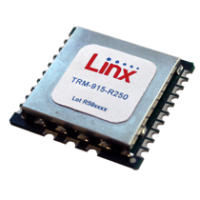 The 250 Series RF transceiver module is designed for reliable bi-directional transfer of digital data over distances of up to 4 miles (6.4km, line of sight). Operating in the 902 to 928MHz frequency band, the module is capable of generating +23.5dBm into a 50-ohm load and achieves an outstanding typical sensitivity of -105dBm. This high output power gives the module exceptional range and also helps overcome noisy environments at shorter ranges.